Ask me questions about Firefly? I finished watching Firefly (and watched Serenity) this past week, so now I get to join you all in being sad that a series set in such a rich universe and with such great characters was so short-lived. I want to blog about it in more detail, but getting anything written has been a bit of a challenge for me lately. I know many of you are huge Firefly fans, though, so I thought I’d ask for your help: if you could ask me a couple of questions about the series and/or the movie, it would probably be easier for me to find an angle and get a post written. Thank you in advance! And thank you also to everyone who recommended the series to me in the first place. Now I’m off to finish reading Terry Pratchett’s Dodger. Have a great Sunday, everyone! I'm a pretty big fan of both so I'm not going to ask a question--it would be too much like writing test questions for me. It's really a western set in the future. I'm also a fan of westerns. One thing that sets it apart is that it's openly a western while so many other space/future science fiction hides the fact that their plot is essentially a western. Your comment is actually very helpful even if it's not a question! The genre mixture and how openly it is presented could be an interesting thing to write about. Well, obviously, there's the race and worldbuilding issue, which I'm sure you have some thoughts on, but I would love to hear your thoughts on the representation of women in the series. Kaylee has always struck me as a particularly well-rounded female character; she's a great engineer, the only time her expressions of sexual desire are looked at askance is when Mal thinks it's a bit too personal for him to hear, and she's nice. I've read a lot of dissection of River (especially in terms of Summer Glau's career), but not much of Kaylee. Also, your feelings on the Washburnes, because oh, Wash and Zoe. I realize none of those are questions, but I'm going to hit publish anyway. So...how does it compare with Buffy to you? Do you think if it had been allowed to continue you'd like it better? I'd also be interested in your thoughts on the representation of women in the series. I love Clare's questiony comments. These are the sorts of things I like to discuss about Firefly. You can go deep with feminist analysis. I'd love your thoughts on religion and Shepherd Book, one of my favorite characters! I'm only about halfway through the series myself; I'm trying to make it last…. 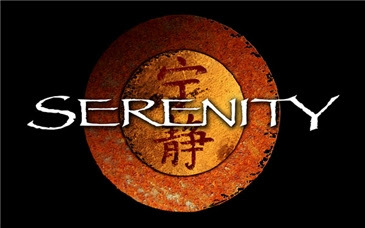 I was really impressed by Serenity--it's great on its own as a movie and as a continuation of the TV show. River, go! :p I would just love to hear your thoughts on her. God, I loved her…one of my favorite characters. I'd be interested in what you think of the whole companion issue. I think Inara is one of the most graceful characters ever, and her relationship with Mal is a rare (and wonderful) kind of stumbling upon. I need to watch Firefly. It's been in my mind to do so for pretty much as long as it was filmed, but I've recently been talking to my boyfriend about it and we've decided to make a point of watching it soon. Thanks everyone, those are definitely helpful! Except a post sometime soon. And Charlie, you should definitely watch it! I want to know why a television show and movie that have such a huge and loyal following were cancelled right under our very noses. This is the kind of thing that irritates the hell out of me! I have loved quite a few shows that were doomed to face oblivion after no more than half a season, and it just makes me so mad that I almost will refuse to watch television unless it's a show that has at least 3 or 4 seasons under the belt. Mal and Inara - feelings??! Also how do you feel about Wheedon's handling of Inara's role as a Companion considering his dicey ideas on sexuality in earlier Buffy series? Improvements noted? Concerns? No one has mentioned Jayne and he is one of my favourites so thoughts on his character would be great. He's very much from the Spike character type tray, but I felt like because Spike had come before him he almost started off automatically darker. Annnd this is not a question is it? Are you making any headcanon predictions for where the program would have gone if it'd continued? What was you favorite episode? Mine were Jaynestown for the laugh and Out of Gas for everything. Care to guess on the possible story arch of your favorite characters? Whedon hinted at Inara's future, how she was sick and dying of it (we see her with a syringe at some point). I would like to know the following: How do you feel about the way the Firefly ensemble makes a family together, and how that compares to the way the Buffy ensemble does? On Firefly they're actually completely isolated from anything external to their spaceship, for most of the show's run -- do you think that has a significant impact on the ensemble dynamic? That's my question! You probably have a post already sorted out, but I'd be interested to know what you thought of the above. I love ensemble casts. Oh, how I loved Serenity and Firefly and the characters! I still grieve at it's loss. I never wanted an end to their adventures.